Sparsholt College Hampshire has formed a partnership with global packaging company Huhtamaki which will give their 2014 RHS Chelsea Flower garden, The Paper Chase, a truly sustainable theme. Huhtamaki’s environmentally friendly BioWare packaging range runs through every element of the College’s garden for the forthcoming flower show. The manufacturing process and green credentials have inspired the design; plants are being grown in compost created from disposable BioWare cups used by all Sparsholt campus students and both the compost and BioWare products will feature at the show in May. It’s not just horticulture students who have been involved in the project. Every student and member of staff based at the College’s Sparsholt campus are also playing their part. Since December last year all hot drinks sold in the College restaurant and bar have been in BioWare cups. 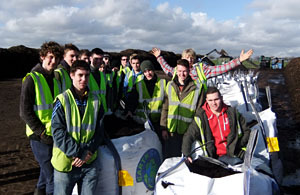 The Horticulture students involved in the project have very much become recycling champions around the College campus. Their efforts have been rewarded as the cups have now been recycled and collected and taken off site for composting by another of Huhtamaki’s partners, the Woodhorn Group. Plants for the garden are to be grown in this compost thereby completing the circle. Sparsholt College Hampshire has a long history of Chelsea medal success achieving 5 Gold medals, 3 Silver-gilt medals, 4 Silver medals, 3 Bronze medals since 1998.